According to Andy Marsh, CEO of Plug Power, 2040 will be the year that hydrogen fuel cells are the power source of choice for all kinds of devices. However, even if hydrogen fuel cells are a great solution, they are not going to make economic sense for every application. Lithium-ion batteries and future battery chemistries, along with new power generation, storage and fuel technologies may be good fits in some of these applications. By 2040, Plug Power envisions that advancements in renewable electricity and biogas will drive down costs allowing for competitive green hydrogen fuel. This can be done on-site or centrally with distribution to the site. The latter option will include using liquid hydrogen due to the density of the fuel, which can be better transported and require a much smaller footprint for future fueling stations. Today, we can find captive vehicles like fork lifts, yard dogs, ground support equipment and people movers. These are electrified vehicles where economical fuel cell solutions can be “dropped in,” and they are captive fleets which simplifies fuel distribution greatly. The next great market is one that shares some of these factors. For example, vehicles that are tethered and local, that is those that leave, but come home each day such as delivery trucks, shuttles, postal trucks, fleet cars. Over the next year to five years, this opportunity looks similar to that of the captive vehicles, but just in a slightly bigger area. The ratio of dispensers to deployed fuel cells will be very similar to the captive market. Beyond that – in the next four to seven years – hydrogen will make inroads into non-industrial local equipment, like buses, taxis, fleet cars and utility vehicles, with smaller, efficient distributed liquid hydrogen fuel assets. Regional and national vehicles, such as consumer, class 8, drones and autonomous vehicles, will come over time as we gain traction in the captive, tethered and local vehicles and as the network of hydrogen fuel improves. 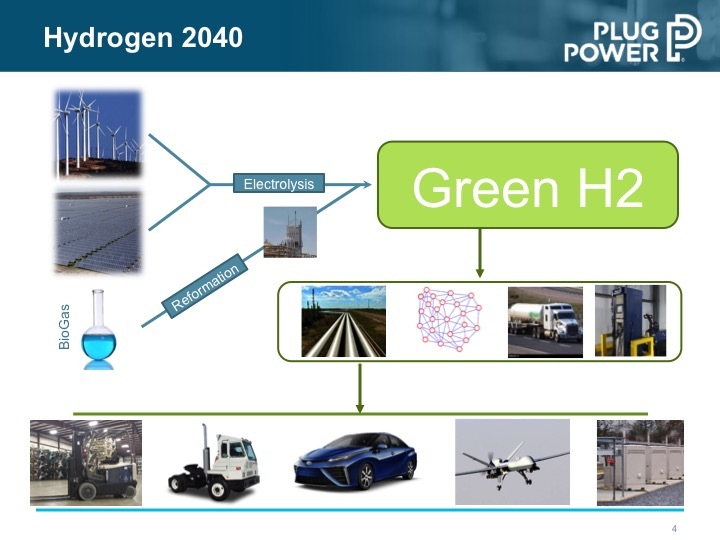 To get to the hydrogen city concept that includes the captive, tethered and local and regional and national fleet above, we need to develop a comprehensive plan and roadmap to fund, develop and implement a repeatable expansion of hydrogen fuel and mobile and stationary power applications for a regional deployment, Plug Power says. The catalyst to this development is affordable, reliable hydrogen.